This monumental collection of new and recent essays from an international team of eminent scholars represents the best contemporary critical thinking relating to both literary and philosophical studies of literature. 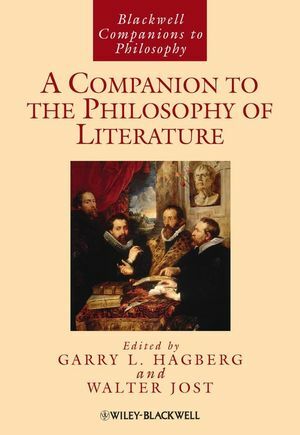 Garry L. Hagberg is the James H. Ottaway Professor of Philosophy and Aesthetics at Bard College, and has in recent years held a Chair in the School of Philosophy at the University of East Anglia and a visiting fellowship at Cambridge University. He has published widely in philosophical and literary contexts; his recent books include Art and Ethical Criticism (Blackwell, 2008) and Describing Ourselves: Wittgenstein and Autobiographical Consciousness (2008). He is joint editor of the journal Philosophy and Literature. Walter Jost is Professor of English at the University of Virginia. He is the author of Rhetorical Thought in John Henry Newman (1989) and Rhetorical Investigations (2004), and has edited or co-edited six previous books, including (with Wendy Olmsted) A Companion to Rhetoric and Rhetorical Criticism (Blackwell, 2004).